A piece of silicon less than three inches across may speed up the arrival of 5G mobile networks in the next few years. IBM Research and Ericsson have developed a compact antenna array that can aim high-frequency radio signals at mobile devices and shoot them farther than they otherwise could reach, the companies said. Silicon integration makes it thin and energy efficient so it’s more commercially viable. Carriers expect 5G networks to deliver cellular data speeds in the gigabits per second, far faster than what today’s LTE services offer. They also expect benefits like less power consumption, lower latency and the ability to serve a lot more devices at the same time. But before they build those networks, the carriers will need equipment that’s not too expensive to turn a profit for them. IBM and Ericsson say the 64-antenna package they’re announcing on Tuesday pushes 5G a long way toward commercial reality. 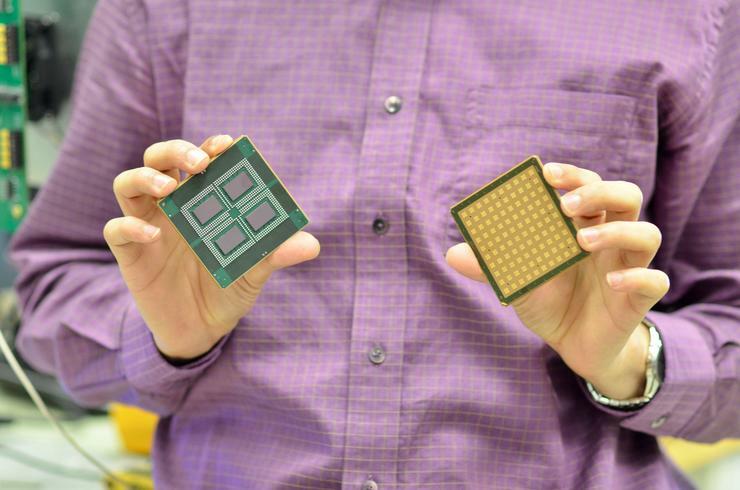 In a two-year joint project, the IBM and Ericsson researchers packed key components of an antenna module, such as power amplifiers, into a single IC (integrated circuit). Then they combined four of those ICs, plus 64 solid-state silicon antennas, in a package that measures 2.8 inches (7cm) on each side. The area of the module was dictated by physics, because the antennas can’t get any smaller. But integrating other components in an IC made the package slimmer, cooler and more efficient, said Hakan Andersson, 5G product manager at Ericsson. Packages like this will go into small cellular base stations that use frequencies in the 28GHz band, one of several millimeter-wave bands that are expected to make 5G possible. Millimeter waves aren’t useful everywhere but are being considered for indoor spaces and crowded urban areas. Such high-frequency signals normally can’t travel far, but emerging technologies like the part developed by IBM and Ericsson can focus those signals into beams and point them at users’ devices. They claim it’s the most precise system of its kind. It’s quick enough to follow devices being carried by users or moving in cars at highway speeds, the companies say. 5G smartphones and other mobile devices probably won’t get 64 antennas, but they may use beam-steering with a smaller number of antennas, Andersson said. IBM and Ericsson’s antenna array can change direction in 200 microseconds or less, and it uses dual polarization to send signals in two directions at once, reaching more devices. But there are no moving parts in the system. It shifts the phase of each antenna electronically to change the direction of the signal, said Alberto Valdes-Garcia, IBM Research staff member and manager of the RF Circuits and Systems Group. Until now, cellular networks have never used frequencies above 6GHz. Several higher bands, including ones around 24-27GHz, 38GHz, and 70GHz as well as 28GHz, have more available bandwidth than today’s lower frequency cellular bands. That means more capacity, so more devices can get faster service. The principles used in developing the new ICs can be applied to other millimeter-wave frequencies, Valdes-Garcia said. The technology is being announced on Tuesday at the International Solid State Circuits Conference in San Francisco. The 28GHz packages are expected to be used in base stations that will go through trials later this year. Large-scale commercial deployment of 5G networks isn’t expected until 2020.